Soul Friday is a QTPOCI dedicated dance party. Photo courtesy of Soul Friday. After fights broke out in Chicago during the 2012 Pride Festival, Phillipe Cunningham approached a police officer to ask about a safe route to walk home. At the time, Cunningham had recently transitioned and noticed during this interaction a different type of aggression and animosity directed at him. Cunningham, a queer, transgender Black man running for Minneapolis City Council in Ward Four, said many queer and trans people of color and Indigenous folks (QTPOCI) have stories like this – times when they were trying to have fun, ask for directions or simply occupy public space – and a police officer responded with hostility. From Philando Castile to Fong Lee, the Twin Cities have been the site of many tragic and fatal encounters between POCI and police, which is why the QTPOCI community voiced their concerns over police presence at Pride this year — particularly on the heels of St. Anthony police officer Jeronimo Yanez’s acquittal in the death of Castile. There’s a violent history between the police, queer community and people of color, Cunningham said, so when the Twin Cities Pride Festival made a last-minute decision to include police presence in the parade it was a missed opportunity for building trust between these communities, Cunningham said. In addition, QTPOCI folks feel deterred from going out to public events and nightlife venues because historically, city policies, like spitting and lurking laws, have been used to target people of color. Although Minneapolis City Council repealed the spitting and lurking laws in June 2015, research still shows police brutality disproportionately affects people of color and those who deviate from heteronormative gender roles, according to a 2016 study done by the National Coalition of Anti-Violence Programs. In 2011, tensions exploded in Minneapolis and nationally when CeCe McDonald, a then 22-year-old Black, trans woman, was violently attacked at night by three white people downtown while out with her friends. McDonald defended herself from her attacker by fatally stabbing him and when the Minneapolis law enforcement intervened, they charged McDonald with second-degree manslaughter – she later accepted a 41-month prison sentence plea deal, but was released after 19 months. “When you add all these layers, there’s a history of trauma,” he added. Oscar de la Luna, a queer and non-binary Latinx artist, moved from El Salvador to the United States as a child. Two years ago, they moved to Minneapolis. De la Luna frequents queer nightlife spaces like house shows, art performances, Hipshaker, a funk and soul dance night, and queer dance parties like Grrrl Scout. Luna uses a bike as their mode of transportation to these venues, which they said makes them more accessible to street harassment. They’ve been verbally harassed, physically threatened and had things thrown at them, particularly in downtown Minneapolis. “Nice outfit homo” seems to be the phrase harassers like to use. De la Luna said they usually agree about the outfit and often respond by smiling or blowing a kiss. But this type of flagrant street harassment isn’t uncommon or without danger, especially for QTPOCI folks. Last June, in the worst mass shooting in United States history, 49 people, most of whom were Latino, were killed and 53 severely injured when an armed gunman stormed Pulse Nightclub in Orlando, Florida. According to the same 2016 study, 60 percent of survivors of anti-LGBTQIA and anti-HIV hate crimes identified as people of color, with 29 percent identifying as Latinx and 21 percent as Black or African-American. While QTPOCI are at a greater risk than white queer folks to experience violence in mixed company or from non-queer folks, QTPOCI also feel ostracized within LGBTQIA spaces due to the presence of a cis-gender, gay, white, male hierarchy that disproportionately harms trans folks of color. Back when Cunningham used to host and organize queer parties in the Boystown neighborhood in Chicago, he said he was “a bit of a nightlife persona.” When he came out as transgender in that environment, the community support shifted. “I started navigating these same spaces, but now as a gay man, it became hostile,” Cunningham said he felt like a social pariah. Similarly, de la Luna said when a white person expresses how they find de la Luna’s looks desirable – such as comments about their “full lips” or curly hair – de la Luna wonders if they’re being exoticized. Because of de la Luna’s relatively fair skin, many people also don’t assume de la Luna’s Latinx identity, often asking if they are Italian or Filipino. De la Luna said navigating LGBTQ spaces as a nonbinary person can also be traumatic. LGBTQ folks have misgendered de la Luna or told them they are performing their identity, adding to feelings of gender dysphoria. “As somebody who didn’t come out as genderqueer until like a year ago, it was a very alienating space,” de la Luna said. 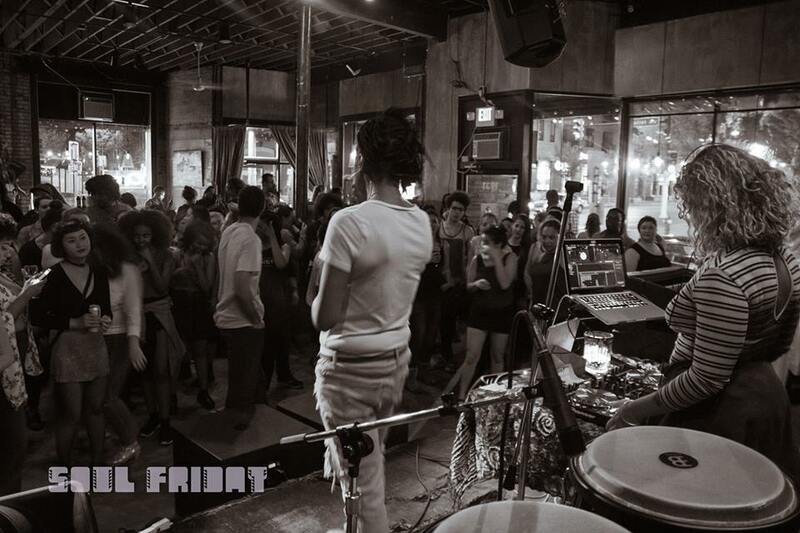 Nicole M. Smith, a Twin Cities artist, is an organizer of Soul Friday, a monthly dance party for queer women of color. DJ Keezy and Sally Nixon are also organizers of Soul Friday. Unlike gay bars in the Twin Cities, Soul Friday’s venue rotates. Smith said the space Soul Friday organizers work to create at each of these events is sacred and carefully curated. Since Soul Friday’s venue changes, the organizers frequently have conversations with venue management about gender neutrality, staff and security. They make the bathrooms gender neutral and talk to staff about using gender neutral terms when addressing folks. It’s a priority for Soul Friday that event staff and security reflect POC as much as possible, Smith said. “We always hold the community at the core of what we do in our process,” Smith said. For Soul Friday organizers, that means providing opportunities for queer, trans, indigenous people of color to cross-promote events specific to the community. Incorporating art at Soul Friday – such as spoken word, dance and burlesque by QTPOCI – is an intentional way to not only give artists in the community a platform but also acknowledge the community’s trauma. Roxanne Anderson, who was the 2016 Twin Cities Pride grand marshall, has been involved with organizing the Power to the People area at Pride for 16 years. They are also a co-owner of Cafe Southside and co-founder of Rare Productions – both touchstones of the Minneapolis QTPOCI community. Although members of the LGBTQIA community were outraged with TC Pride’s decision to involve police presence, Anderson said the outcome of these community discussions resulted in a reduction of visible police officers and excluded cops outside of the Minneapolis Police Department – a small, but significant improvement compared to past TC Pride Parades. In previous years, officers from neighboring cities and suburbs have worked TC Pride as well, Anderson said. In addition, excluding all police presence at Pride would have also excluded LGBTQIA officers, firefighters and folks who work for Emergency Medical Services, Anderson said. TC Pride wanted to recognize the history of racism and violence against the LGBTQIA community, Anderson said, as well as reduce the stress and trauma for people at the event. Cunningham said retribution and healing between the Minneapolis Police Department and queer community starts with training and reflection on past harms done by police to the LGBTQIA community. Doing this work with members of intersectional communities, he said, will clarify how police can build stronger trust and relationships with members of more specific communities. This type of healing and relationship building also needs to occur within the LGBTQIA community, he said. Even in spaces where marginalized folks hang out and party, Cunningham said anti-Blackness and racism is pervasive.